26% Body Fat, Zero Lean Mass Loss W/ HIIT + 3x500mg Green Tea Supp in 10Wks | Is EGCG Liver-Toxic? Lean, not skinny: In the long run HIIT + GTE could take you there, but there's one caveat... at least w/ the green tea. The social networks are full of women complaining that they are not losing fat. If you ask them what they have tried to ignite body fat loss, the answer usually is: reduced energy, fat/carb intakes and, if any sport at all, endless cardio sessions... now, while studies show that this approach to fat loss works, it's (a) mostly the caloric deficit that determines the loss of body weight and (b) is often accompanied by significant lean mass losses. An attractive alternative would be (i) not having to diet, (ii) not having to do endless cardio sessions and (iii) having a fat loss supplement that actually works. Looking for more cutting edge exercise and supplementation science? Catechins; SRIT1; PGC-1 "(Afzalpour. 2017) that appears to suggest that this 'attractive alternative' does actually exist - at least for those women who have the most body fat to complain about for whom the scientists speculated that it could be the combination of "green tea consumption along with HIIT training" that "would improve body composition in overweight individuals and would show significantly greater improvements compared green tea consumption or HIIT training alone" (Afzalpour. 2017) - without dieting (or I should say: without prescribed dieting, the scientists did not access the women's food intake over the 10-week period; there was just a baseline reading)! Table: Anthropometric characteristics of the subjects in the three groups (Afzalpou. 2017); note: there were no significant baseline differences in body composition and fitness between the three groups of young women. no training and supplementation control group (CON). 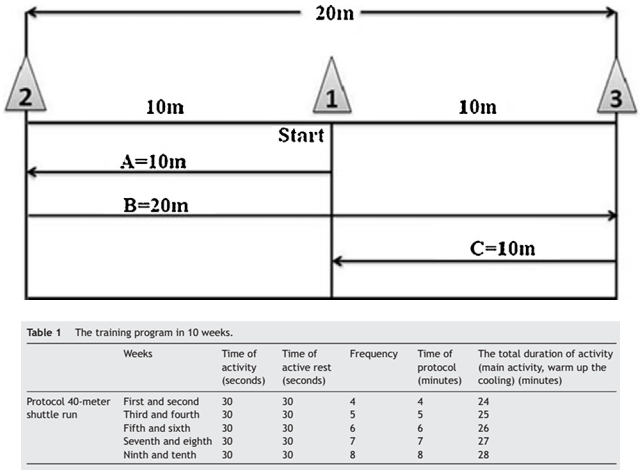 Figure 1: Overview of the HIIT parcours and the periodization scheme (Afzalpour. 2017). "[t]he protocol of HIIT required the participants to finish a determined path (20 meters) with their maximum speed within 30 seconds. The starting point of the test was exactly in the middle of the obstacles, i.e., 10 meters from each obstacle. The training included running from the middle line to the first obstacle and then returning a 20-meter path to the second obstacle. After each run, there was an active rest for 30 seconds (Figure 1). In the first and second weeks, the training was performed with 4 repeats, in the third and fourth weeks with 5 repeats, in the fifth and sixth weeks with 6 repeats, in the seventh and eight weeks with 7 repeats, and in the ninth and tenth weeks with 8 repeats (Figure 1). In each session before the training protocol, the participants had [to] warm up for 5—10 minutes, and they cooled down for 5—10 minutes at the end of each session." (Afzalpour. 2017). the activity by pulse meter and using maximum heart rate formula (220-age). 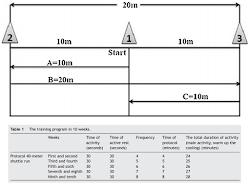 Besides, the Borg scale (6—20) was used to ensure greater control over the intensity of training. 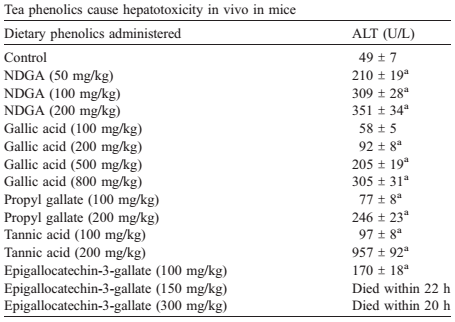 Rodent studies clearly confirm the hepatoxicity of high doses of green tea; with the often-hailed EGCG having the most significant impact on the liver health of mice - with death being a consequence of the injection of a human-equivalent-dose of "only" 12mg/kg, or 850mg - luckily, the oral bioavailability of EGCG is low (Galati. 2006). Weren't there recent studies showing ill-health effects of green tea? Well, "recent" is relative. I guess it all started w/ the testosterone-reducing effects of green tea I discussed back in 2011, already. More recently, however, there have 24 case-reports of liver problems in response to the consumption of green tea supplements in man from 1999 to 2009, only (Mazzanti. 2009) - a response of which scientists say that it is due to (-)-epigallocatechin gallate (EGCG) or its metabolites "which, under particular conditions related to the patient’s metabolism, can induce oxidative stress in the liver" (Mazzanti. 2009). As bad as it may sound, this can (a) explain why it worked in the study at hand - practically speaking it did the opposite of what the anti-oxidants which hampered the gains in Bjornson et al. (2015 | discussed in detail, here), did it added to the pressure to adapt - and (b) and must be reconciled with the already low and chronically decreasing bioavailability of EGCG with chronic administration. One important advice I want to give you at this point is still: do not fall for the notion that 'more helps more' (toxicity of really high doses of GTE in rodents has been proven multiple times), do not buy a pure EGCG product and stop using your green tea supplements if you notice the first symptoms of liver problems (usually otherwise inexplicable fatigue). An intensity that yielded impressive effects, not only, but especially in terms of the subjects' body at loss that was not unreliably assessed with BIA, but - assuming the authors of the study knew what they did - with body fat calipers (I calculated the more meaningful absolute body fat and lean mass values based on the body fat % from the study). A 26% body fat loss and a 7% improvement in body fat percentage - without dieting - that's quite huge... isn't it? Figure 2: Total changes (kg) in body fat and total lean mass and corresponding relative changes (in %) above the bars. Yes, it is, but the way these beneficial effects on the women's body composition relates to their SIRT-1 and PGC-1alpha level is a putative one. Yes, the levels increased significantly in both the HIIT and the HIIT+G group, but the study design does not allow for statements about a causal link between the two: body fat and SIRT-1 and PGC-1a expression. In the end, I guess most women will say that it doesn't really matter, the fact that the PGC-1A expression was another 31% higher in the green tea group (HIIT+G) and went hand in hand with an exclusively significant increase in VO2-max (for the other treatments, the changes were non-significant) would yet argue in favor of an independent or interactive effect of green tea on the expression of these regulatory proteins that could have triggered the additional benefits. Figure 3: Relative changes in SIRT1, PGC-1A activity and physical fitness as measured by the women's VO2-max. What does matter, however, is the potential hepatoxicity (see red box), especially green tea products with a high EGCG content appear to have for some, but not all individuals. Against that background it is very unfortunate that (a) the product in the study at hand was either not standardized or the standardization was not reported, and that (b) any effect would have gone unobserved, in the study at hand, simply because no relevant parameters were measured... reason enough to re-address the issue in (a) the red box (general discussion) and the bottom line (weight loss adjuvant specific discussion). Don't get me wrong: There are a lot of studies showing beneficial effects of green tea extracts, including the recently discussed study showing that "Green Tea Extract Reduces the Amount of Insulin You Need to Store Your PWO Carbs by ~20%". Unfor-tunately, its probably individual liver-damaging effects are being observed in more and more studies, too. What do I have to know: The concomitant use of 3x500 mg green tea supplements ingested with all three main meals accelerates the already impressive body fat loss a 10-week HIIT (3x per week) regimen produces in otherwise healthy overweight young women. Now, the question remains: Is it worth taking the (probably small, but existing) risk of putting your liver health in jeopardy? You got to answer this question for yourself, but if you're having liver problems already, high dose EGCG supplements should IMHO be a no-go... the good news is: since the authors didn't report any EGCG standardization for their supplement, it is very likely that they are also not necessary and drinking green tea, which is a way of preparing your own hot water extract from tea, alone, with every meal could boost your fat loss and is associated w/ a reduced risk of liver cancer (Ni. 2017) | Comment! Afzalpour, M. E., E. Ghasemi, and A. Zarban. "Effects of 10 weeks of high intensity interval training and green tea supplementation on serum levels of Sirtuin-1 and peroxisome proliferator-activated receptor gamma co-activator 1-alpha in overweight women." Science & Sports (2017). Galati, Giuseppe, et al. "Cellular and in vivo hepatotoxicity caused by green tea phenolic acids and catechins." Free Radical Biology and Medicine 40.4 (2006): 570-580. James, Karma. Effect of dietary pretreatment and obesity on (-)-epigallocatechin-3-gallate (EGCG) mediated hepatotoxicity and the underlying mechanism. Diss. The Pennsylvania State University, 2016. Mazzanti, Gabriela, et al. 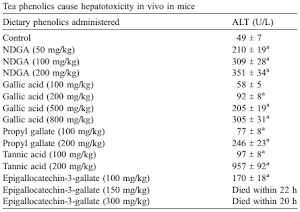 "Hepatotoxicity from green tea: a review of the literature and two unpublished cases." 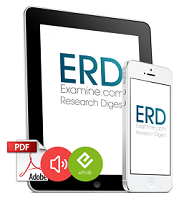 European journal of clinical pharmacology 65.4 (2009): 331-341. Molinari, Michele, et al. "Acute liver failure induced by green tea extracts: case report and review of the literature." Liver transplantation 12.12 (2006): 1892-1895. Ni, Chen-Xu, et al. "Green Tea Consumption and the Risk of Liver Cancer: A Meta-Analysis." Nutrition and Cancer (2017): 1-10.